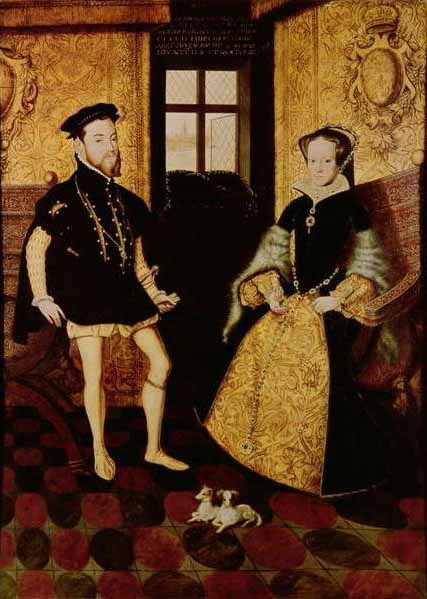 The wedding of Queen Mary I and King Philip II of Spain took place on July 25, 1554. It was the feast day of St. James the Greater, the patron saint of Spain. The venue chosen for the event was Winchester Cathedral, seventy miles outside of London where the Wyatt Rebellion had just been quelled and summer epidemics threatened. Even though it was pouring rain, the wedding was a grand affair. The preparations for the wedding were based on those of Mary’s mother Catherine of Aragon to Prince Arthur Tudor. So that everyone could see the proceedings, a wooden walkway was constructed and covered with carpets extending from the west door of the cathedral to the front of the choir. The walkway was four feet high and ended in a dais upholstered in purple and about four feet square which overlaid the entire central nave adjoining the choir screen. The platform had an octagonal railed dais where the actual ceremony was to take place. The walls of the cathedral were draped with flags, carpets and standards. Philip arrived about mid-morning accompanied by his English and Spanish attendants who were wearing their most splendid attire. Philip himself was dressed in the French style to match Mary’s clothes. He wore a bejeweled white doublet and breeches with a decorative golden mantle given to him by Mary. It was made of cloth of gold trimmed in crimson velvet and lined with crimson satin. The mantle was trimmed with thistles of curled gold and each of the twenty-four buttons on the sleeves were crafted from four large pearls. To complete his costume, he wore the ceremonial collar of the order of the Garter which Mary had sent to him earlier. Philip walked down the nave on the raised platform until he reached the dais. He went to the far end of it and down some steps to the left where there was a canopy prepared for him and he sat down in a chair in front of the rood loft. As he awaited the Queen, he was accompanied by the foreign ambassadors who were seated in order of precedence. They included his father the Emperor’s ambassador, that of the King of the Romans, those of Bohemia, Venice and Florence as well as some English and Spanish knights. The French ambassador did not appear. In the center, there was a table in front of the screen and to the right was another canopy and chair for Mary. This chair, where Mary actually sat, is still preserved in the cathedral. The position of the Queen’s chair clearly indicated Mary’s superior position as the reigning monarch of England. Mary entered the cathedral through the west door at about 11:30 am accompanied by the leading noblewomen of the kingdom. One chronicler noted she was ‘richly dressed and adorned with jewels’ which is completely within her character. Her train was carried by the marchioness of Winchester assisted by the lord chamberlain Sir John Gage. The dress was described as in the French style made of rich delicate cloth (tissue) with a wide border and sleeves embroidered on purple satin and set with pearls and lined with purple taffeta. She had on a fashionable short-sleeved jacket known as a partlet which just covered the chest along with a high collar and a white satin kirtle. Once her presence was known, Philip was alerted. Mary took her place under the canopy beside the dais and began to pray. Stephen Gardiner, Bishop of Winchester, along with five other bishops in full pontificals, made their way from the choir and climbed up five steps to the railed dais on the platform. They all stood in the center with Gardiner, as the diocesan bishop and also Lord Chancellor of England, positioned in the most prominent place. Mary and Philip rose and greeted the bishops. They were joined by the foreign ambassadors, the earls of Bedford and Lord Fitzwalter, and the lord great chamberlain, the earl of Oxford. It was at this time in the ceremony that Don Juan de Figueroa, a doctor of law and councilor of Charles V, as well as regent of the chancery of the kingdom of Naples, walked forward to present Philip with letters patent. In these letters, Philip’s father bestowed upon him the title and full rights of King of Naples. Gardiner read the letters in Latin and then gave a short explanation in English for the benefit of the audience. This new rank entitled Philip to a sword of state to match Mary’s as Queen of England and there was a brief delay in the ceremony until one was found. Gardiner announced it was time for the couple to be married in person according to the terms of the articles that had been approved by the Emperor, Philip and Mary. The bishop then displayed the marriage treaty in its Latin form, giving a short commentary in English. The bishop made it clear the treaty had been approved by Parliament, stressing that the realm of Spain had also given consent to the terms. He then began the marriage ceremony by first asking if anyone knew of any impediment to the marriage, either due to kinship or a preceding claim. There was a pause and then the audience answered there was none. Next, Gardiner read the papal dispensation from Julius III which allowed these two cousins to marry. The wedding service was then conducted in both Latin and English. Gardiner asked who would give the Queen away and four peers came to the fore. The marquis of Winchester and the earls of Derby, Bedford and Pembroke acted on behalf of the whole kingdom as Mary had no close male relatives. The congregation cried out their support for their Queen and the vows were then exchanged in the two languages. Philip then placed a plain gold band and three handfuls of gold coins on the bishop’s bible. The bishop blessed them. Mary’s main attendant, Lady Margaret Clifford, daughter of the earl of Cumberland and a close relative of the Queen, came forward with the queen’s purse and Mary placed the gold in it. Mary and Philip then kissed. During the kiss, the earl of Oxford held the Queen’s hand and then the earl of Pembroke, bearing a sword, stepped to stand before the new King of England. As trumpets sounded, the newlywed couple and all those who had been on the dais followed the bishops into the choir. They all took their places under canopies at either side of the High Altar and High Mass was celebrated by Gardiner and two other bishops. The other three acted as servers. The Queen and her lay company received biscuits and spiced wine (hippocras). A canopy, held by the leading peers of England, was brought to the foot of the altar and Mary and Philip processed under it hand in hand down the nave, out of the Cathedral and into the east hall of Wolvesey castle where the wedding banquet was set up. On one end of the hall, a raised platform had been erected and after going up several steps, Mary and Philip sat at the royal table, along with Bishop Gardiner who sat a little away from the king and queen. They were seated under a canopy of state with Mary placed in the prominent position on the right with a chair that was more ornate than Philip’s. Those at the royal table were served by English courtiers. In the hall, large buffets had been set up to display impressive gold and silver-gilt plate. Nearly one hundred and forty people dined on thirty dishes in four courses. These included the privy councilors and ambassadors at one table, and two long tables for the English and Spanish guests who all stood as they ate. At the other end of the hall, a dais was set up for the musicians who played during the entire meal. At the appointed time, four heralds and a knight appeared. The knight gave a speech acclaiming the marriage and afterwards, Philip invited the English councilors to drink a toast. The meal finished about five in the evening and Mary drank a cup of wine to the health and honor of the guests. The entire party moved to another hall where the festivities continued until nine, including dancing and other merrymakings. Mary and Philip left the party early to have a small supper separately in private. Bishop Gardiner finally blessed the marriage bed and the king and queen retired. Philip was up by seven the next morning and heard mass. After mass, the king transacted royal continental business. Mary followed tradition and remained in seclusion with her ladies for the entire day.